Cytotoxic T Lymphocyte Associated Protein – 4 (CD152). Function: Competes with CD28 for CD80/86 ligands on APC surfaces, sequesters them from CD28 molecules. Activates protein phosphatases (SHP2 and PP2A) which acts on the CD3zeta chains and Akt respectively. This regulates the scale of early stages of T cell activation of the immune response, the TCR must be engaged (it needs immunogenicity). It is upregulated starting at 1 hour post T cell activation with maximal upregulation 2-3 days later. Half life is 2 hours. Location: This molecule is intracellular until T cell activation, when it is phosphorylated and moves to the cell surface. If phosphorylated it cannot bind to AP-2, which serves to remove it from the surface. It is found on CD4+ and CD8+ T cells. Constitutive expression on Tregs. FoxP3 is a TF for CTLA4 transcription. Impact: Mutations are associated with autoimmune diseases. K.O. mice display lethal systemic immune hyperactivation phenotype. Blocking this protein in humans see adverse advents in the skin and GI tract. CD80 induced by LPS, which is regulated IRF7 (interferon regulatory factor 7). NFkB also indicated in B cells. and PU.1 in DCs. Programmed Death – 1 (CD279). Function: Contains a ITIM receptor, aims to limit T cell activity in peripheral tissues, limiting the response and autoimmunity. Binds to PD-L1, constitutively expressed on most cells, and PD-L2, expressed on APCs during inflammation. Activated receptor inhibits kinases of T cell activation via SHP2, a phosphatase, that acts on CD3ztea and thus affects Zap70 activation (zeta chain associated protein kinase 70) in T cells and Igalpha/beta and Syk in B cells. 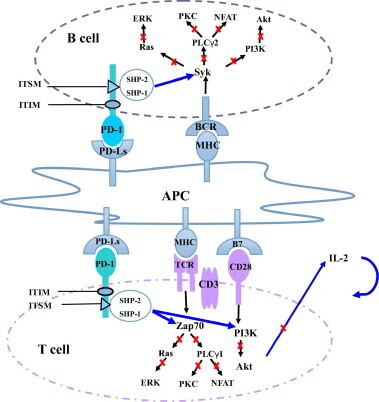 Location: Induced on active T, B, and NK cells by NFATc signaling. High expression on Tregs. Persistent expression with chronic infection. Impact: Regulates activity of T cells in tissues and tumors. Knock out mice show autoimmunity with elevated serum IgG2B and IgA, these occur later in life and are less prominent than CTLA-4 KO mice. PD-L1 induced by IFN-gamma , Th cells, STAT1. Function: Binds to ICOSLG (B7RP1, B7 protein family) on APCs. Impact: Involved in T cell proliferation and growth, specifically in Th2 cells. Knock out shows reduced T cell proliferation and IL-2 secretion. Affects Th2 cell population. B7RP-1 expression regulated by TNFalpha on B cells (+, stimulatory), monocytes (+, stimulatory) and DCs (-, inhibitory). Function: Contains an ITAM and a ITIM. Binds to HVEM (herpes virus entry molecule) which is expressed on resting T and immature dendritic cells. T-cell inhibition achieved by interacting with TNFR and B7 homologs. BTLA-HVEM complexes negatively regulate T cell immune responses. Location: Expressed on activated B and T cells. Expression induced during T cell activation. Expressed on Th1 not Th2. Function: Subtle effects controlling T cell function. Binds GAL9 (Galectin-9) on APCs. Binding induces death of IFNgamma producing CD4 T cells. Contains extracellular Ig and mucin domains. Function: Binds MHCII molecules (is a CD4 homolog). Restrains T cell fucntion under conditions. Impact: KO mice show increased T cell expansion in response to immune reactions that have already been initiated. Cells can express multiple checkpoint molecules. Loss of both LAG3 and PD-1 lead to multiorgan lymphocytic infiltration and death in the animal.